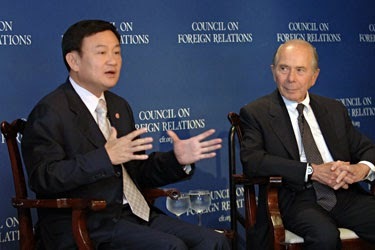 Land Destroyer: Thailand: US Passionately Pleas for "Compromise"
Thailand: US Passionately Pleas for "Compromise"
February 18, 2015 (Tony Cartalucci - NEO) - Corporate-funded think tank, the Council on Foreign Relations, in their magazine Foreign Affairs, recently published an article titled, "Silencing the Shinawatras." In it, author Matthew Wheeler encapsulates current US policy toward Thailand regarding the recent ousting by military coup of its proxy regime headed by Thaksin Shinawatra and his sister, Yingluck Shinawatra. At a time when the nation needs compromise, stability, and engagement across the political spectrum, Yingluck’s impeachment appears to many as a settling of scores, and its partisan implications make the prospect of progress look ever further off. The sitting military regime, calling itself the National Council for Peace and Order (NCPO), promised to “return happiness” to the Thai people, overcoming social divisions and political rifts. Yingluck’s impeachment risks signaling that the military has surrendered all pretensions of impartiality, increasing the possibility of future turmoil. Wheeler argues throughout his piece that Thailand must compromise with the ousted Shinawatra regime or face further instability. He briefly touches on the unprecedented violence that resulted after the removal from power of Thaksin Shinawatra in 2006. He fails to mention the specifics of that violence, or the immense mass murder that took place while Shinawata was in power. Indeed, while in power Shinawatra had some 3,000 innocent people extrajudicially executed in the streets over a 90 day period in 2003. The following year, he violently put down a demonstration in Thailand's troubled southern provinces, killing 85 people in a single day. He also implemented a campaign of terror and assassinations that saw at least 18 human rights advocates killed or disappeared during his first term in office. At least two of his political opponents have been outright assassinated, and a third narrowly escaped a broad daylight attack that saw over 100 bullets riddle his car in the center of the city. His "red shirt" street mobs have regularly gunned down, hacked to death, or otherwise brutalized Shinawatra's critics, and much of the success his political movement has enjoyed has been on the back of the fear and intimidation these "red shirts" have until recently inspired. 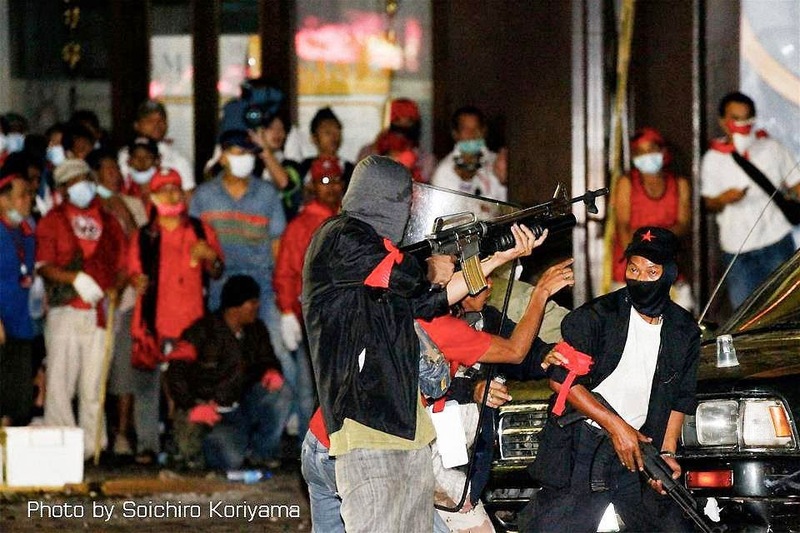 In 2009 and again in 2010, Shinawatra backed violent "red shirt" riots in Bangkok. The 2010 riots also included some 300 heavily armed terrorists who triggered bloodshed that would see nearly 100 killed. 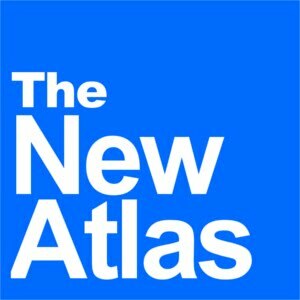 And just recently, as the largest street demonstrations in recent Thai history sought to unseat Thaksin Shinawatra's sister, Yingluck Shinawatra, from power, he once again deployed heavily armed terrorists to kill and maim nearly 30 unarmed men, women, and children, and left maimed over 800 more. Image: Does Matthew Wheeler and others echoing current US policy honestly believe Thailand should "compromise" with an ousted regime that fielded literal terrorists on the capital's streets, leaving nearly 100 dead in 2010 alone? Wheeler then is basically saying that because Shinawatra is willing to use such violence, and if Thailand would like to avoid further bloodshed, it should capitulate to his demands and compromise, accommodating his desire to once again dominate Thailand's political landscape. Or in other words, capitulate to threats of terrorism and violence. But what Wheeler actually illustrates, is precisely why a military coup was required - twice - to remove this corrosive, violent influence upon Thai society in the first place - and why it is absolutely impossible to afford this threat any further compromise or accommodation. 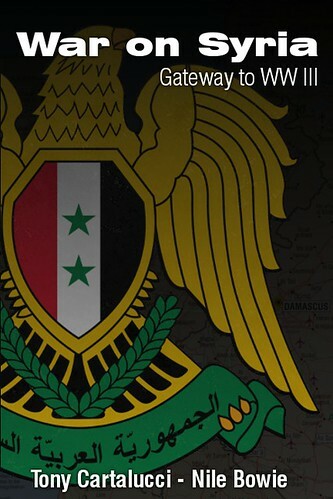 The United States is famous for its stated policy of never negotiating with terrorists. It appears that Thailand has learned after nearly 20 years, the merits of this policy. Appeasing and accommodating those who set no limit on what they are willing to do to advance their own agenda is to invite bloodshed and self-destructive instability that will compromise the country economically, politically, and socially for generations to come. The future of Thailand depends on uprooting Shinawatra and those like him from power permanently, and laying a framework that prevents the weeds of violent despotism and nationwide corruption to take root again. While Wheeler insists that Thailand must compromise with Shinawatra, in reality Thailand cannot afford anything less than the complete and permanently uprooting of his regime and its political networks from Thailand's political landscape. It should be noted that Wheeler hails from the International Crisis Group, another corporate-funded think tank amongst whose membership also sits Kenneth Adleman, a lobbyist for Thaksin Shinawatra and a chairman for the US State Department's "Freedom House" organization which along with the Naitonal Endowment for Democracy (NED) funds pro-Shinawatra propaganda networks inside of Thailand like the notorious online publication "Prachatai." The International Crisis Group also includes as a member, George Soros, a convicted financial criminal and whose Open Society organization also funds Prachatai and other pro-Shinawatra fronts. It is no surprise then, that Wheeler argues Shinawatra should be accommodated - but despite his claims otherwise, such an accommodation is certainly not in Thailand's best interests, but rather in the best interests of those that fund Wheeler's think tank and his colleagues who have, over the years, painstakingly groomed and propped Shinawatra up politically at great cost to the Thai people.